Peppy Peppermint Bark for sale. Buy online at Zingerman's Mail Order. Gourmet Gifts. Food Gifts. I’m a sucker for traditions, especially when they’re this delicious. Peppermint bark has been a Christmas staple for my family thanks to my great-aunt Caddy’s sweet tooth and love of Fannie Farmer’s confections. While I’ll never forget Aunt Caddy, this peppermint bark from Chocolate Signatures in Toronto has erased all memories of that other candymaker. 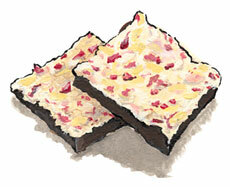 Dark Belgian chocolate is topped with white chocolate, then coated in a layer of crushed peppermint candies. Each slab of bark is nearly a quarter inch tall and thick with peppermint. Comes in a hot red tin.